Symbiosis have now recorded the music for four double albums of guided meditations by internationally acclaimed lecturer, author and healer, Denise Linn. Denise is one of the world's most sought after metaphysical speakers, and draws enormous crowds to her lectures and workshops at festivals and expos for Mind-Body-Spirit in London, Sydney and the USA. "Denise is one of the most inspiring people we have found working in the area of self-healing and personal growth. Her guided meditations are very deep, effective, and most importantly, totally captivating and convincing. 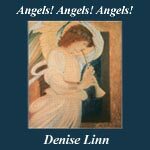 It has been a very rewarding experience creating music to accompany her words on ANGELS! ANGELS! ANGELS!, DREAMS and PHOENIX RISING, and has enabled Symbiosis to discover new directions in our own work. In fact, much of the music on our album Amber & Jade was inspired by our work with Denise." "Denise herself is genuine, caring, and very gifted at enabling people to start to heal themselves and realize their full potential despite the difficult and stressful lives they often lead. I think the combination of Denise's soothing voice and and our gentle ambient music is very strong and potentially beneficial, and we are very proud of the results!" Contains meditations designed to help us know that we are not alone - that higher forces can be called upon to help us in times of need - and to help us recognize Angelic qualities in ourselves and others. Inspiration for more healing, energy, laughter and a sense of support from day to day. Denise shows how to enter the magical realm of dreams to access the power for personal transformation, self-healing and creativity through four powerful new guided meditations. Symbiosis have recorded nearly two hours of original music to accompany powerful guided meditations on this audio release by Denise. Music on all the above albums is by Symbiosis, with additional playing by Nick Magnus on Angels! and Phoenix Rising. A goddess lives in every woman. She is the part of each of us that is beautiful, sumptuous, and remarkable. But she isn’t always easy to find. Since early childhood, we have been conditioned to put the needs of others ahead of ourselves - and somewhere along the way we have lost our connection to our Divine Feminine spirit. There is a goddess yearning to be born within you. 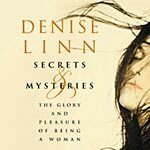 In these CD’s, Denise reveals how you can activate your inner strength to become a magnificent and glorious woman. Do you long to live a life that is meaningful and desire a spiritual connection to the cycles of the earth? Do you crave the solace amidst life’s hectic pace. These four meditations are a must for any Goddess-in-the-Making. Each meditation expands the majesty of the feminine experience and deepens your connection to the sacred places within you. 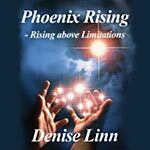 Denise's other best-selling recordings and guided meditations include: Complete Relaxation; Journeys into Past Lives; Weight Loss and Cellulite Reduction; Past Lives and Beyond; Life Force; Way of the Drum and Cellular Regeneration - How to Heal. QED Productions Ltd, Unit 11, Summit Road, Cranborne Industrial Estate, Potters Bar, Hertfordshire, EN6 3QW, England. 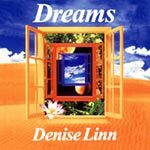 Symbiosis have composed and performed all the music for the first video release by DENISE LINN, the internationally acclaimed lecturer, author and healer. Titled Instinctive Feng Shui for creating SACRED SPACE, her video demonstrates the use of space clearing as a way to clear and enhance the energy of your home or work area. Simple yet highly effective methods are shown to help you transform your environment into a haven of peace, and to turn your home into a source of hope and renewal. Symbiosis have composed the soundtrack for the 55 minute programme, which can be ordered in VHS PAL or NTSC versions from the UK company QED PRODUCTIONS.